I’m not really sure how I feel about that fact. First off it just hasn’t FELT like Christmas this year. It’s usually cold here at Christmas. Last year we even had a dusting of snow Christmas Eve. This year it’s just been a battle to keep the temperature under 70 degrees. It’s kind of hard to enjoy snuggling up in your cozy PJ’s, with a warm blanket, and hot chocolate when you’re still rocking your flip flops and t-shirts. Baking super sweet Christmas treats sort of looses it’s appeal when the heat threatens to chase you from your kitchen. This treat is nice because you can totally melt your chocolates in the microwave (no stove required). I also like it because you can change things up to suit your tastes. Maybe you only like vanilla, or only chocolate, or a combination of both. Maybe you have a box of candy canes laying around you can crush for the top. Or maybe you have a bag of peppermint candies. You really can’t mess this up. Line a baking sheet with wax paper. Set aside. If layering 2 different chocolates melt the chocolate in 30 second increments until smooth. Spread chocolate onto wax paper. Place cookie sheet in the refrigerator with completing the next step. Melt white chocolate in 30 second increments. 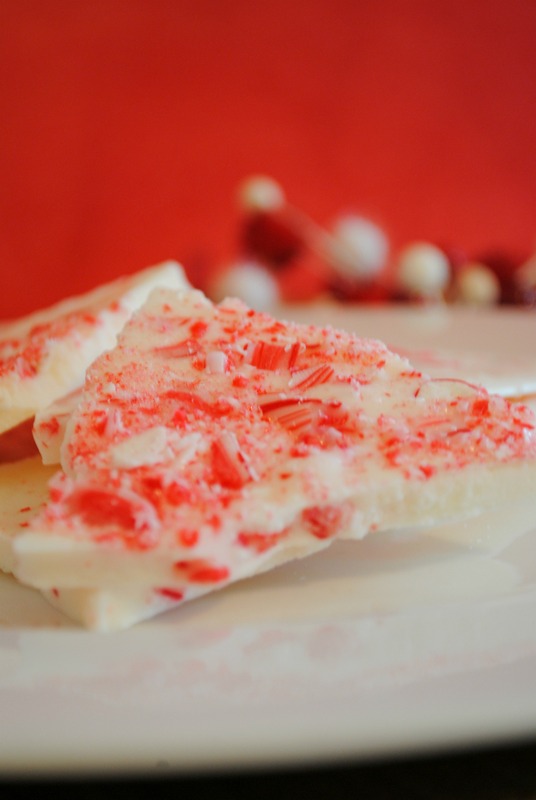 Stir in a portion of the crushed peppermint. Remove cookie sheet from refrigerator and quickly spread the white chocolate/peppermint mixture over the dark chocolate layer. Work quickly and be careful not to disturb the dark chocolate layer. 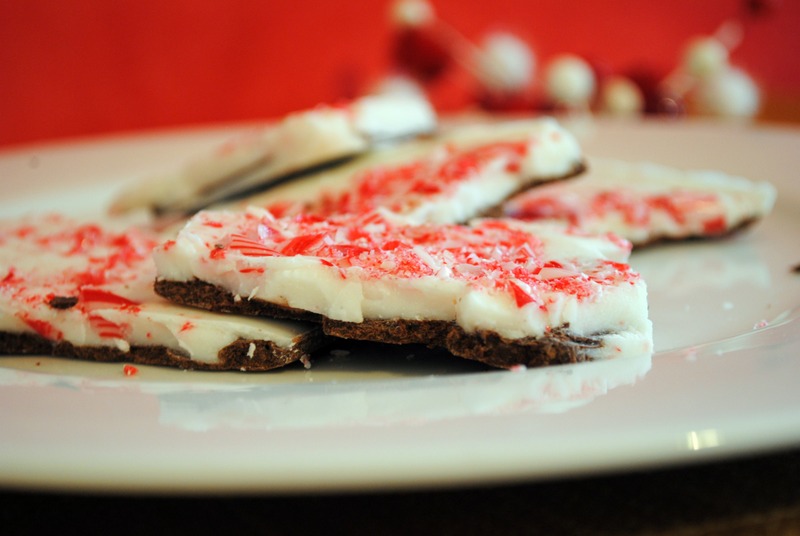 Sprinkle the top with remaining crushed peppermint. Gently tap (OK, pick up your cookie sheet and drop it from a short distance onto your counter) your cookie sheet onto the counter. This helps even out the top surfaces as well as make sure your crushed peppermint adheres to the top chocolate layer. Place back into the refrigerator and allow the chocolate to set up. Once set peel off the waxed paper and break into pieces. *If using white chocolate chips for this recipe I recommend a brand such as Ghirardelli. You want a high quality chocolate or you will end up with a waxy taste.